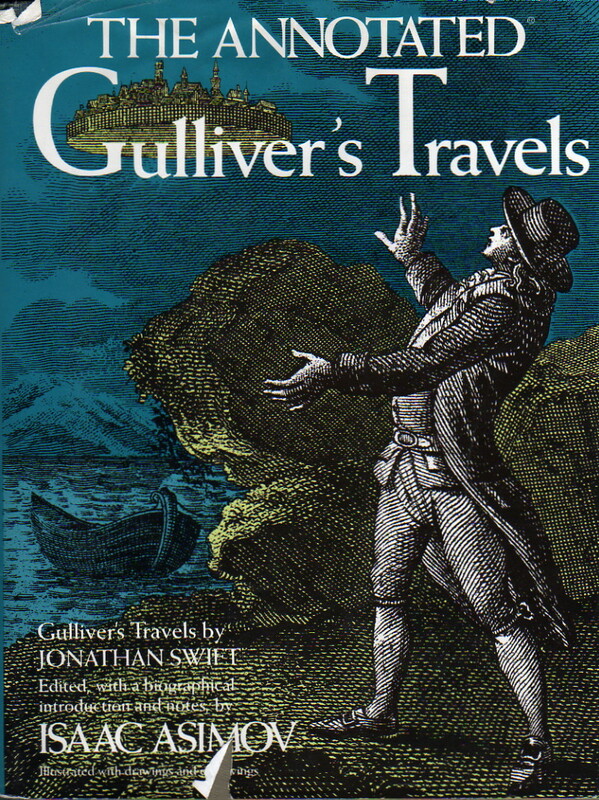 Published anonymously in London in 1726, Gulliver’s Travels was an instant success, and its popularity has never waned. In this handsome new annotated edition, the leading science and science-fiction expert of our century, Isaac Asimov, offers his unique vision of Swift’s classic. A helpful and informative commentator, he discusses in detail Swift’s life and his circle; eighteenth-century personalities and politics; the state of geography, education, and medicine at the time; and hundreds of other things that immeasurably enrich our understanding and appreciation of the satire. In addition, Dr. Asimov comments on the science and science-fiction aspects of the story, which have never been fully discussed before. He praises certian passages in the book as examples of the firstreal science-fiction writing and points out that some of the things Swift described as fantasy two and a half centuries ago—like satellites around Mars and invisible light—have turned out to be real. At the same time, Dr. Asimov criticizes Swift for this ridicule of the sciences of his day and his benighted insistence on the superiority of times past. Whether guiding the reader through the intricacies of Tory and Whig politics in Swift’s time or speculating with tongue in cheek on how many ounces a Liliputian brain might weight and whether a Brobdingnagian eagle could really fly, Isaac Asimov is invariably witty and entertaining. This edition is profusely illustrated with the work of three centuries of Gulliver’s Travels illustrators, including various eighteenth-century English and French artists; Gavarni, J.J. Grandville, and T. Morten in the nineteenth century; Rackham and Herbert Cole from the turn of the century; and twentieth-century masters like Rex Whistler, Bofa, and Fritz Eichenberg. The text, which is complete and unexpurgated, is based on the Faulkner text corrected by Swift himself and considered definitive by many scholars in the field. This is not in the series of annotations published by Doubleday which includes Asimov’s Annotated ‘Don Juan’, Asimov’s Annotated ‘Paradise Lost’, and Familiar Poems, Annotated. Rather, this is a part of the series published by Potter which includes annotations of other English prose classics, including Martin Gardner’s Annotated® Alice (it was at Gardner’s suggestion that Asimov did this book). The series was an excellent one, with oversize books richly illustrated and thoroughly annotated. I own several myself other than this one. Note that Potter very carefully made “The Annotated” a registered trademark to keep other publishers from mimicking what they did. Yes, I said “prose.” Unlike Asimov’s other annotations, this is an annotation of prose, of a novel—of a rather well-known novel, as it happens. The result is that, because I tend to prefer prose to poetry, and because I enjoy the work being annotated here quite a bit, I end up enjoying the book as a whole quite a bit more than is the case with other annotations. As before, Asimov is pointing out background material which the general reader of Gulliver’s Travels may not know. Since, however, this is a satire, the general reader might think they understand what Swift is taking about when, in fact they do not understand it, and the net result is different. Asimov ends up more as a literary critic than is usually the case, analyzing the work itself more than is usually the case. He does quite well with it and the result is, overall, effective. This is as a result is the best of Asimov’s formal annotations.